Batman and Joker with mounts, (that's a dire wolf version of Ace the Bathound for Batman's mount) Aquaman, Wonder Woman and Green Lantern round out the heroes, Scarecrow, King Shark, and Mr. Freeze round out the villains in wave 1. And that's a Castle Grayskull-like Batcave playset in the last picture. All of it is Amazon exclusive from Funko, and available now. While I like sword and sorcery toys, I was never into Masters of the Universe, so I am not sure how much this appeals to me yet. I think the Wonder Woman figure looks decent, the rest I am kind of meh on, and likley to give a pass unless I see them in person first and really like them. 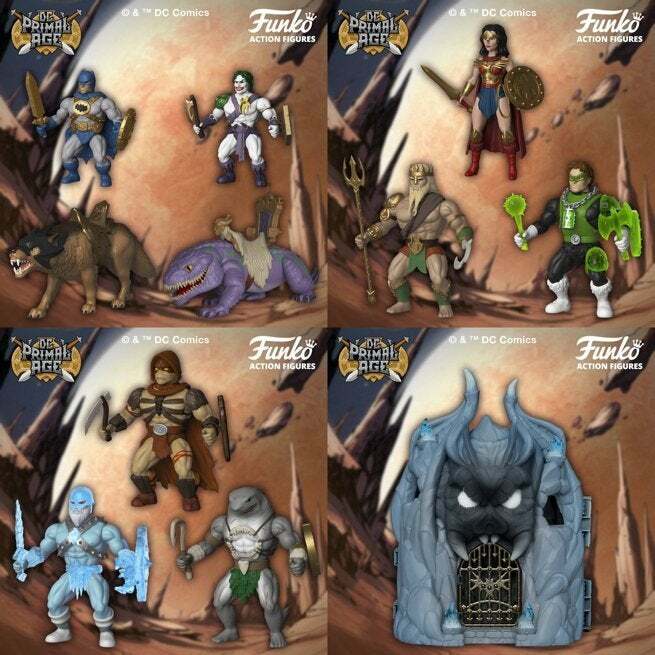 It is a companion line to Funko's Savage World line, and I might get the Conan pieces from that line, but I am still undecided even on that. I grew up on Super Powers and Masters of the Universe, so the combination is totally making me geek out. That being said, do I really need these? I wish the playset were either more intricate or sold at a more inviting price point. Sometimes, a playset can sell me on an entire toy line. As it stands, we'll see with this one. It seems like a really odd mash up, I loved the original masters of the universe line and the reboot...but super heroes in that setting? I'm not sure what to think. I preordered Batman, Joker, Wonder Woman and Green Lantern for The Collection. Like Shax I grew up on those two lines and the meeting of the two made it something I had to have at least a little of. I might have to get that dire wolf Ace the Bathound mount figure. Not so much the rest of the line, but that one appeals to me. I haven't seen any of the figures in stores yet. Are they not out yet? They were available as an Amazon exclusive first, and now they are a Target in store exclusive. 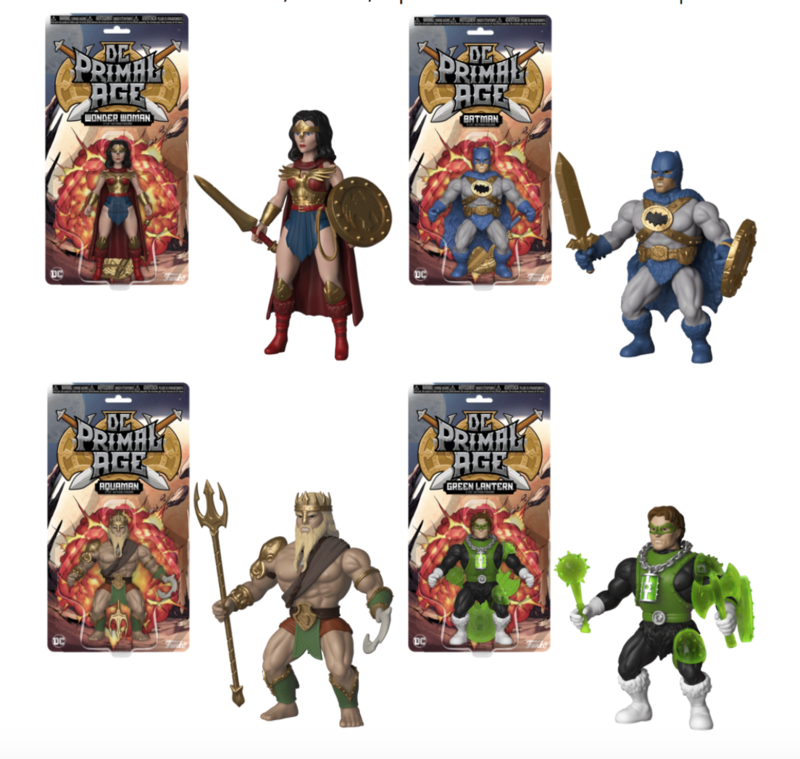 From what I understand, a lot of Targets were sold out the first day they hit the shelves as Funko, DC, and MoTU collectors were all waiting for them to hit the shelves. Also apparently, there were some quality control issues in the first wave that was Amazon exclusive, but were fixed in the Target release (mostly paint application, but also durability of the limbs on the figures themselves were problematic). So, yes they are out, but it's not surprising you haven't seen them as the first shipment sold very well. Then again, some Targets are very slow getting stock from back rooms to the shelves, so they may also be sitting the store rooms of some Targets waiting to go out. Target is hugely inconsistent, breaking street date on some releases and waiting weeks after street date to put out others. Target had an endcap display with a few figures, the Batman t-shirt, the lunch boxes, the comic book, and a Batcave (which was pretty beat up).